Demands for transportation improvements have greatly outpaced the funds available to meet them. In response to this demand, MoDOT has established various mechanisms for successful public/public and public/private partnerships. These expand financing options for transportation projects serving public purposes including highway and rail projects, transit equipment, air and water transportation facilities and elderly/handicapped vehicles. The benefits to a project assisted by these partnerships may include inflation cost savings, early economic and public benefits, financing tailored to the project's needs and a reduced cost of project financing. By pooling our efforts and resources we can often accomplish what may have previously seemed unlikely. Why we Partner. When we partner to build or enhance transportation infrastructure, we do so because we have shared purpose: to build the best and most cost effective project we can, when it is needed. Partnering helps us realize benefits that we would not have enjoyed through separate efforts. Building transportation infrastructure often has a positive effect on the local economy. When we partner to accelerate a project, citizens gain the benefit of the infrastructure earlier. By partnering, we leverage funds that separately would not have been enough to take on the project. This allows partners to hasten the time it takes to get a project to completion, resulting in accelerating these potential benefits. Accelerating construction can help avoid additional costs due to inflation. This article also discusses the Cost Share Program as well as Missouri Transportation Finance Corporation (MTFC) loans. Local funding options such as Transportation Development Districts (TDDs) require the formation of a development district to be initiated by petitioning the circuit court. Sponsorsed programs utilize resources from third party entities to fund and support transportation-related projects or services. In return, these entities are provided public acknowledgement for their participation in the program. EPG 141.4 Transportation Improvement Program Amendments ensures statewide consistency in the transportation improvement programming process. 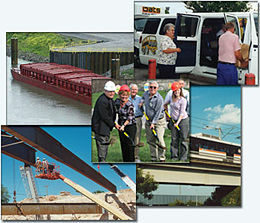 The dispute resolution process provides MoDOT’s transportation partners with guidance on how to resolve project disputes. EPG 141.7 Transportation Improvement Program Approval ensures statewide consistency and assists MoDOT employees in fulfilling the requirements for programming transportation projects. Finally, this article provides a glossary of acronyms and definitions. Articles in "141 Partnership Development"
This page was last modified on 20 November 2018, at 12:08.